Arrowhead Vines are fast growing, easy to care for plants from Central America. They are often mistakenly identified as Philodendrons to whom they are closely related. Their foliage colors range from bright green to bronze, with many variegated cultivars. Syngoniums are also sometimes known as Goosefoot Plants or Nephthitis. All parts of the Arrowhead Vine can be toxic if ingested, The sap may irritate skin. and are useful for growing in dish gardens and terrariums. As Arrowheads mature, their 5" leaves begin to elongate up to 12" and add multiple lobes. or they can be trained to climb up a moss covered pole, totem or trellis. so they are almost always grown as house plants. Arrowhead Vines are very adaptable to growing in most conditions found in the average home. They grow best in bright, indirect light. The foliage will burn in full sun. They will tolerate lower light levels but tend to get straggly looking with insufficient light. Plant your Arrowhead in a rich, well-drained potting mix. Water thoroughly, but allow the soil to dry slightly between waterings. Reduce watering from fall through late winter. 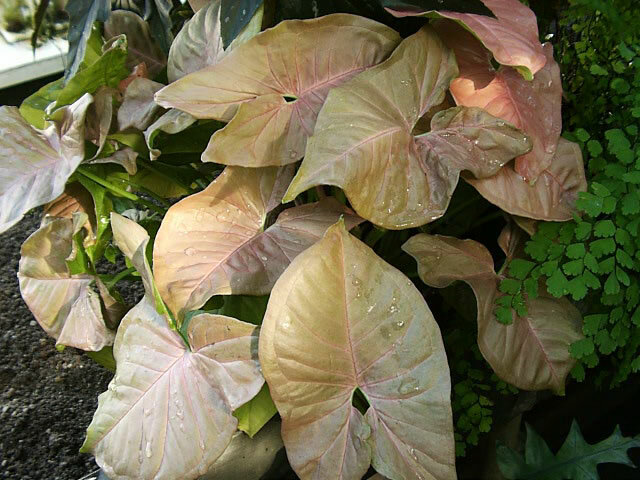 Avoid overwatering as it will cause leaves to discolor and drop, and can cause root rot. Arrowhead Plants prefer daytime temperatures of 70°-75° with cooler nights, but never below 60°. During the dry winter months, you should mist the foliage daily or place the planter on a tray filled with moistened pebbles. Pinch new tip growth to retain a compact growth habit. When they are actively growing, feed Arrowhead Plants monthly, using a half strength solution of a soluble, balanced fertilizer. 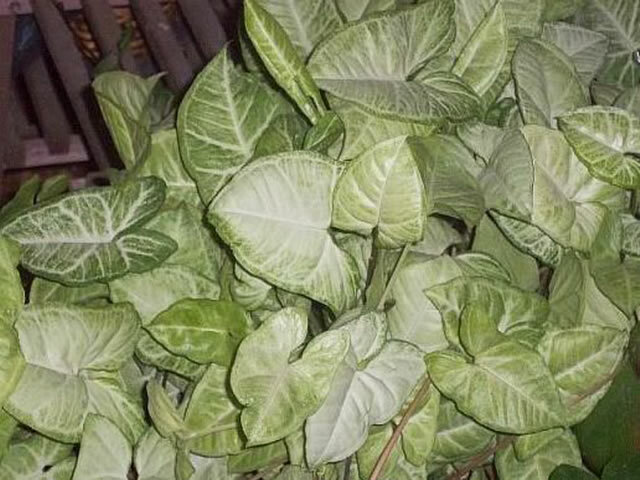 Your Arrowhead Vine will enjoy spending the summer months in a shaded area of your garden, but be sure to check for pests and problems before bringing them back indoors. Watch for spider mites, aphids, scale insects and especially for mealybugs. Always wear gloves when working with Arrowleaf plants! Arrowhead Plants should be repotted every two years, in the spring. The root structure can be divided in half at this time as a method of propagation. The easiest method for propagating Arrowleaf Plants is with stem tip cuttings that can be taken at any time of the year. Arrowleaf cuttings rooted easily in water, but the roots will be more brittle than if rooted in soil, so you should use care not to damage them when planting.